Yesterday I checked the backyard rose bushes, which are leafing out nicely and promise to be full of blooms before too long. I still don't know if I should have left those rose hips on the bushes from last year, but I read somewhere that the birds enjoy munching on them in winter, so on they stayed. 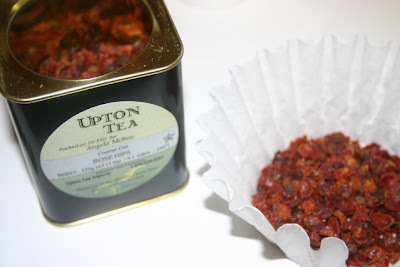 Today, however, I'm enjoying some Rose Hips Tea from the fine folks at Upton Tea, largely because I'm hoping the Vitamin C-packed brew will help me ward off the flu bug that seems to have bitten so many around me. "While the Hybrid Perpetuals were in vogue in late Victorian times, another group of roses appeared alongside them. These were the Tea Roses, which hold a position somewhere between the Old and the Modern Roses. They were a development of the China Roses, some of which have in their make-up an element of Rosa gigantea, which is a very large-flowered species with long, pointed buds. These qualities were passed on to the Tea Roses, which have a delicate beauty, often with the Hybrid Tea type of bud and soft colours and slender, twiggy growth. 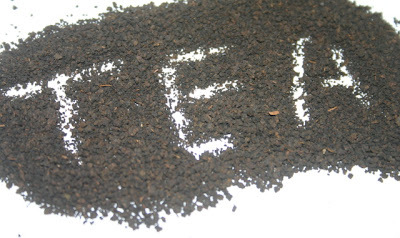 They also have what is known as a 'tea' scent, similar to the aroma from a newly opened packet of China tea." 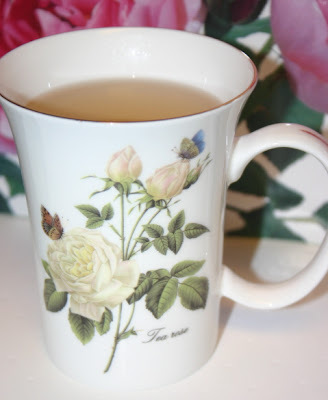 A tea rose is depicted on this tea mug, and when I start searching for new roses to plant this spring, I'll be sure to see if they smell like "a newly opened packet of China tea." 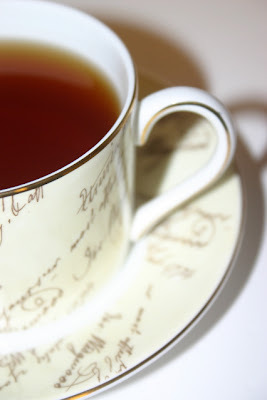 Back on November 30, I wrote about my "Tea of the Writers" blend tea and Wedgwood mug with handwriting on it. 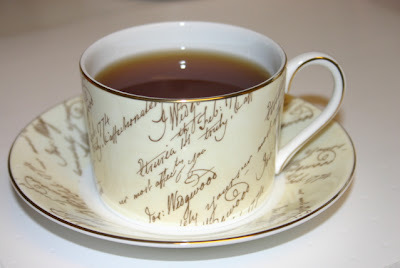 As a writer, I particularly liked the design on the Wedgwood Bicentenary Celebration mug, which featured a facsimile of the handwriting of company forebear Josiah Wedgwood. But I knew that somewhere out there existed the cup and saucer with this same design. I had been looking for this cup and saucer pretty much since it came out in 1995 and I saw a picture of it in Victoria magazine. I found other mugs, coin dishes, a trinket box, but no cup and saucer. Until last week, when I got an eBay alert informing me that a seller had - at long last - listed the cup and saucer! So guess what arrived at my house yesterday! It must be said that tea simply tastes better out of a pretty cup and saucer, and the new tea I had last night (from an unusual source; I must tell you about it) just tasted so wonderful in this set. Also, I just have a feeling my writing will get a boost from having a "writerly" teacup to sip from as I'm working. I told my husband I was so happy with this cup and saucer and the other chintz ones I found recently, I am "done" and will probably never have to buy another cup and saucer. He got a nice chuckle out of that, but we'll see! When I got home from work yesterday it was all gray and rainy. What tea to have? I wanted a strong cup of tea in my sunny looking teacup, so I reached for this tin of The London Cuppa. I received it as a gift a few years ago, and it's just the oddest tea I've ever had. I'd seen this tea with the cute graphics for sale at T.J. Maxx but never bought any for myself, so I was happy to receive it that Christmas. When I opened the tin, I thought, "Well for Pete's sake. Somebody messed up and put coffee grounds in here!" But always the brave tea adventurer, I went ahead and put some in a tea filter. And to my great surprise, it made a nice strong cup of tea! 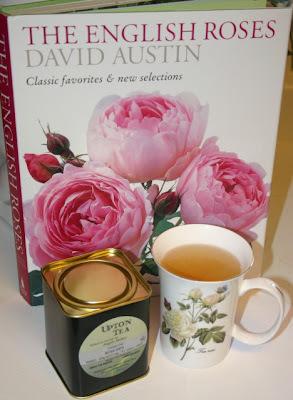 The tin says that this tea "has been blended to account for the London water to give it a robust, deep, rich flavour, which is ideal to enjoy all day, every day." The website listed, thelondoncuppa.com, is not working for me this morning, so I don't know if this company is still in business or not. 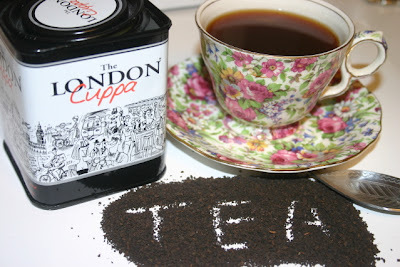 I did, however, find London Cuppa tea listed on some British tea seller sites. But go easy on the amounts; I used a scant four teaspoons in my 6-cup Mrs. 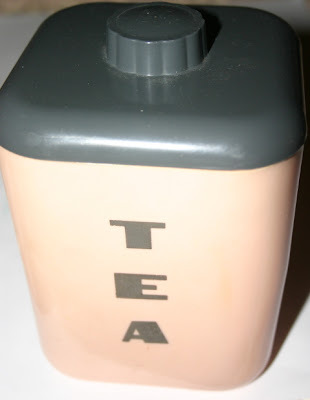 Tea tea maker, and it was still quite strong and required a bit of cream. If any of you have tried this tea, I'd love to hear what you thought of it! 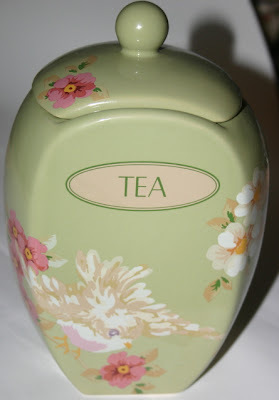 Now here's a category of tea collectible I have yet to discuss: the tea caddy. This blue one is my latest find, a vintage silverplate piece from England with a cobalt blue insert. The insert is some sort of plastic, not glass, which I actually like since that means I cannot break this! 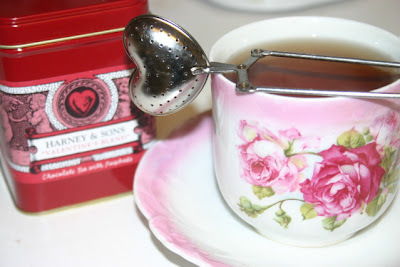 It came with a matching spoon that hangs on the side, which will make this perfect for storing and measuring loose tea. 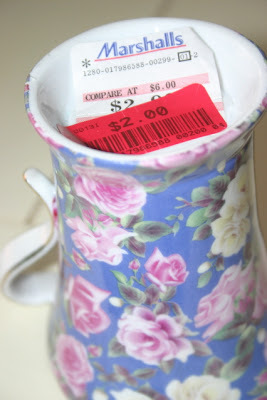 I was also pleased the original hang tag was on the piece. The more "vintage" aspects, the better I like it. 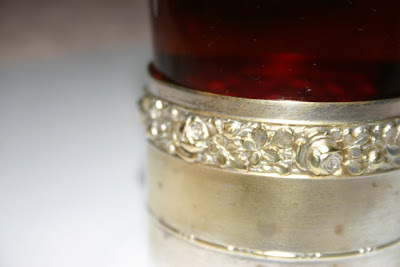 And although the tarnish shows in the photo, I polished this up afterward and now it gleams. Call me odd, but I LOVE to polish silver! 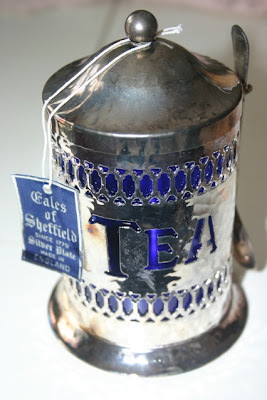 This got me to thinking about some of my other tea caddies, so I thought I'd show some of them. This aluminum one was probably part of a canister set, but I found it in an antique shop one day for just $3 and brought it home. It does have some spots, though, so I suppose I should look into how to safely clean vintage aluminum (soap and water didn't do the trick). This ceramic tea caddy is a new piece that was a Christmas gift from my parents a few years back. It was part of the Songbird Garden collection, which was popular in gift stores at the time. Pretty, huh? 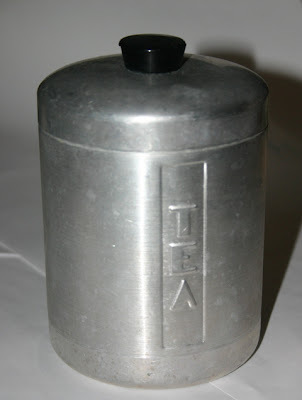 This is another piece I use as a tea caddy, but I know it was part of a vintage canister set because I have the set! My mom found this whole set (which I actually use for storing flour, sugar, coffee and tea) for 25¢ at an estate sale. As I've said before, my mom is amazing! 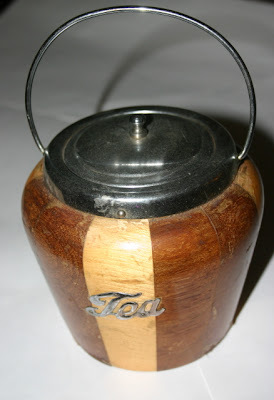 This wooden tea caddy is a piece I bought on eBay years ago. It's not exactly in mint condition and the lid doesn't fit tightly at all, so I don't store tea in it, but I like the look. 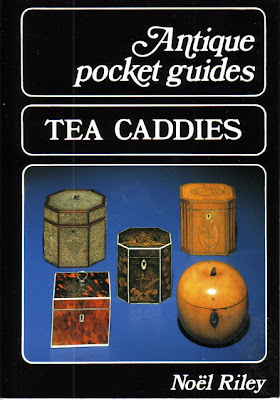 While my collection is more like "The Cheapskate's Guide to Tea Caddies," this little book, "Tea Caddies" by Noel Riley, shows you what tea caddies are going to look like in heaven. Inlaid wood, the finest gold and silver fittings, antique apple- and pear-shaped tea caddies and more. My caddies are nothing like these jewels, but it's fun to know these are "out there." So there you go. Those are all my caddy comments for today! Every once in a while I get to enjoy a full day of Saturday shopping with my mother, and this past weekend it was a most fruitful day. My husband thinks *I* am a good shopper, but I am a rank amateur compared to my mom, whose latest great yard sale find was a full set of vintage white wicker furniture in excellent condition for $5! We usually head to her old hometown of Marietta, and we try to hit as many T.J. Maxx, Marshall's, HomeGoods and Ross stores as we can fit in. It's a rainy, thunderstormy morning here in Georgia, but like many I'm grateful to see the rain here in our parched state. When I saw it puddling on the deck last night, I began to get hopeful about that small plot of land in the backyard where I'm hoping to tend a few plants this Spring. 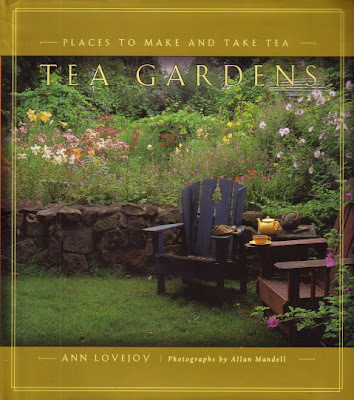 Toward that end, my evening reading (also read during the duller parts of the presidential debate) was "Tea Gardens: Places to Make and Take Tea" by Ann Lovejoy. This 1998 book seems to have been ahead of the curve on the nation's love affair with tea, discussing as it does not just the how-to's of taking tea but the why-to's, such as relaxing and winding down with a cup of tea and a stroll through the garden. The author discusses five different styles of tea garden: the English Tea Garden, the Japanese Tea Garden, the Herbal Tea Garden, the Cottage Tea Garden and the Container Tea Garden. You may, like me, decide you'd really like to incorporate elements from several of these styles into your "dream" tea garden. The book didn't give as much information on the individual plants as I had hoped, but it was a good starter book for anyone thinking of trying to grow a tea garden. 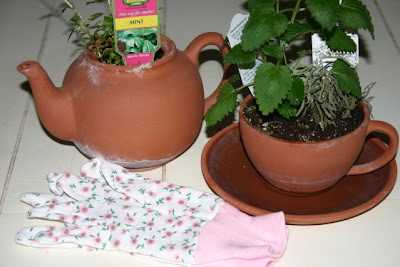 I should probably warn you that I am getting into "gardening mode," and with Spring not far away, it's a good time to start thinking about growing my own herbs, especially those that can be used in cooking and for making tea. These pots aren't that deep so the plants in them are probably more for inspiration than anything else at this point, but I've got some mint, lavender and lemon verbena in them at the moment. And aren't these teacup and teapot pots the cutest things you've ever seen? They're from England and were a birthday gift from a green thumbed friend a few years back, one of the most perfect gifts ever. Are any of you gardeners? Do you grow your own herbs for tea? If so, what do you recommend? Inquiring gardener minds want to know! 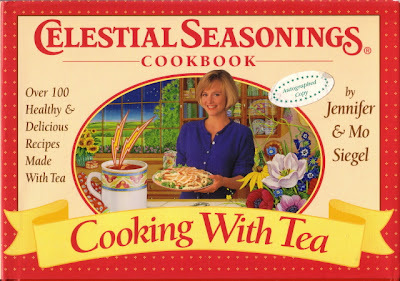 Recently, I was looking for tea books online at my usual sources (eBay, half.com) and came across this "Celestial Seasonings Cookbook - Cooking With Tea." The book tells a bit of the company's history, and the recipes are some of the most unique ones I've seen yet for foods cooked with tea: Mandarin Orange Spice Meatballs, Cranberry Cove Beef Roast, Apricot Ginger Salmon, Harvest Spice Tea Cake, and dozens more recipes with yummy sounding titles. But one sentence in the book really captured my imagination. The author was talking about preparing carrots for her kids one night and deciding to toss in a couple of Mandarin Orange Spice teabags, greatly enhancing the flavor of the carrots. She began to do this with other foods as well, and "Celestial Seasonings teas became the spice rack I didn't know I had." Now THAT appeals to me! I don't necessarily mean CS teas in particular, because to be honest I don't have that many of their teas, but I do like the idea of treating my teas as a "spice rack." Sometimes, one fresh new idea can make the price of a book worthwhile. This was one of those times. Wait! Don't leave! Hear me out! I know, I know, "What is she THINKING?" and all that. I have a good explanation if you'll just bear with me. You see, since the first NASCAR race of the season was Sunday (and isn't it pitiful that I even know NASCAR is supposed to be in all caps? 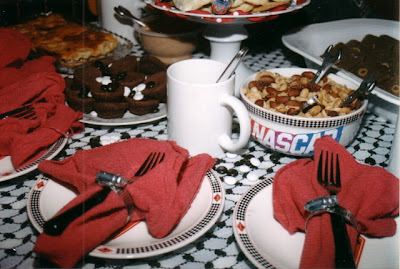 ), I was prompted to go pull out some old photos from the NASCAR Tea Party I created for some guy friends (most of them co-workers) several years ago. 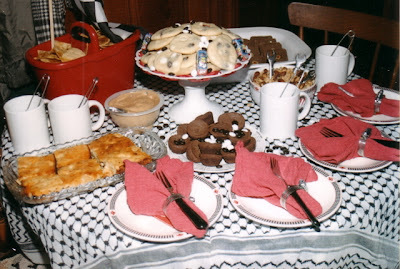 They had been making fun of my love of tea parties, as I recall, when some of them chortled away and suggested I have a NASCAR Tea. "No problem," I said. And it wasn't. I will say that I can count on one finger the number of times I've shopped for tea party supplies at Auto Zone. 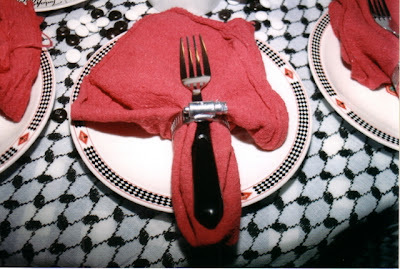 The surly man on duty did not seem nearly as amused as I when I told him I needed red shopcloths (A/K/A, "the napkins") and silvery clamps (A/K/A, "the napkin rings") for a tea party. His problem, not mine, right? The tea selection was easy and obvious (a famous blend I shortened to simply "Earl"), but the treats were, ahem, decidedly non-traditional. I used a recipe that had appeared in our newspaper and made Buffalo Chicken Cornbread Squares as the main savory. I can see by the photo I made some sort of finger sandwich on rye bread, but I'm sorry to report that memory fails me on what sort of filling I used. A red shop bucket, embellished with a NASCAR flag, held chips for the dip. (And no, I've never served cheese dip before or since at one of my teas.) 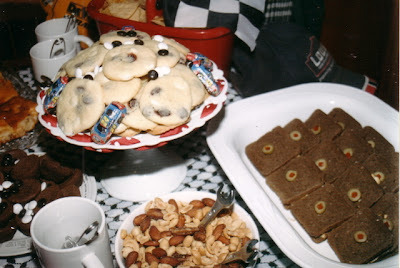 Brownie bites and sugar cookies were decorated with black and white NASCAR M&M's. Mini wrenches served as teaspoons, and black-handled flatware from the dollar store completed this tablescape's serving pieces. The "tablecloth" was actually a bit of fabric from my friend and NASCAR fan Bob, who got it for me on a tour of duty in Iraq. On race day I dropped everything off at the home of one of the guys and ran, and I heard that a good time was had by all. And, I'm pleased to report, never again did these guys challenge my ability to throw a tea party! 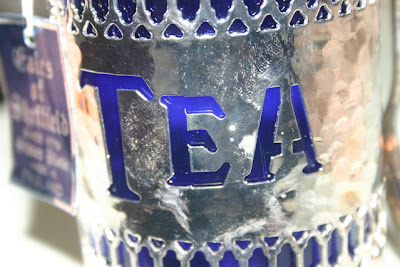 Recently I wanted a glass of iced tea and realized, with no small irony, that I was out. Oh, I had tins of Darjeeling and Chocolate Mint and Russian Caravan and all sorts of fancy flavors and teabags galore, but I had no basic, plain old tea. It was especially funny to me since just a few years ago, I had so many boxes of Red Rose Tea that I was giving them away to family and friends. But then, I had just discovered Wade Whimsies. Do you know about these Wade of England porcelain miniatures? I'd heard somewhere that the figures were premiums offered in specially marked packages of Red Rose Tea. I went a little nuts, buying a box of tea bags every time I popped into the grocery store. 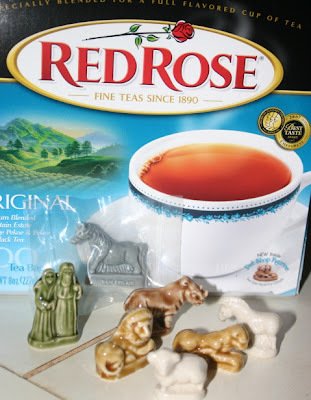 It was worth it as long as I was getting a new Noah's ark figurine, I figured, passing along the excess tea to others. But then I got something like four lambs in a row, my family began to say "No more free tea, thanks! ", and I decided my little tea-buying spree was over. Whether they liked it or not, Mr. and Mrs. Noah's family was complete. On Friday, however, I was out of plain tea and bought a new box of the Red Rose. 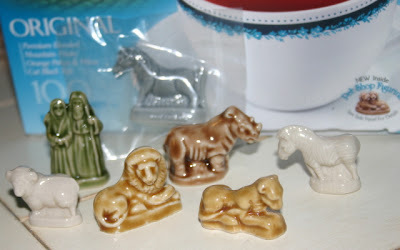 I discovered the Wade Whimsies have moved on to a new series, the Pet Shop figurines, and I got the horse. Happily, my compulsion to buy five more boxes of tea did not rear its greedy little head, so I do not anticipate a pantry full of tea this time. 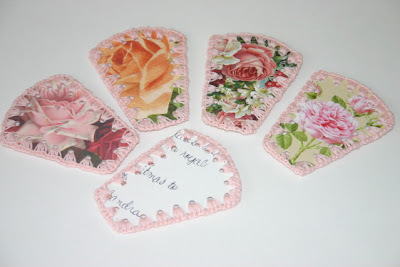 If you want to know more about Wade Whimsies, there's a neat website at wadewhimsies.com. 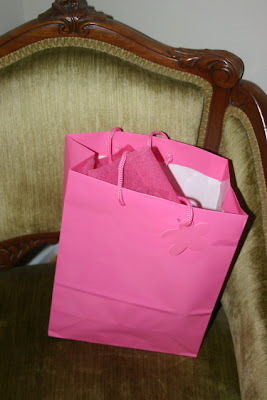 Yesterday's Valentine's gift giving was such fun, but it wasn't without a bit of drama this year! 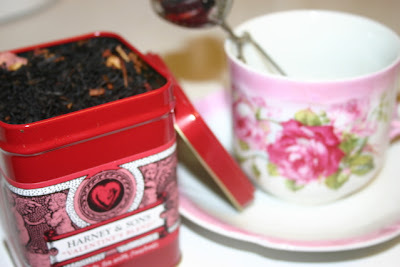 You see, last week I had ordered some of Harney's Valentine's Blend, a tea of chocolate and rose petals. One tin was for a friend who's had a bit of a rough time lately; the other would be divided into individual tea-filter bags and shared with numerous girlfriends in cards and treat bags. On Tuesday night, however, I received an e-mail from Harney telling me the shipment was scheduled to arrive by UPS ... on Friday! 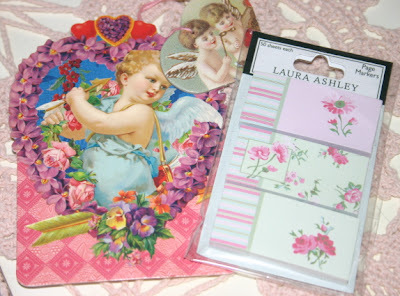 Other Valentine's gifties: A couple of tea-loving friends got Laura Ashley post-it type notes. 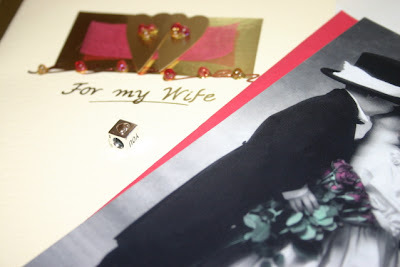 These are mine, but some just like them went to the friend who gave me this sweet Victorian Valentine. 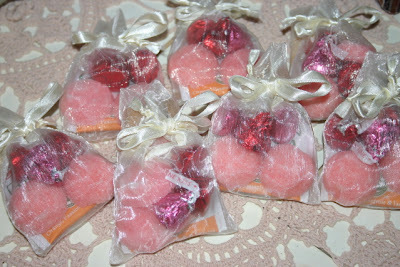 Here are the little fabric bags that were packaged up for the co-workers: tea, Hershey's kisses, some of those pink rose sugar cubes I made last week. 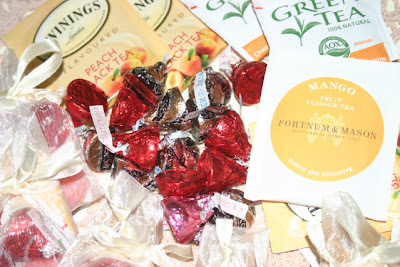 And a final note: For the friend who's had some challenges in life recently, I put together a bag of the Valentine's Blend tea, Hershey's kisses, chocolate raspberry cookies, and Dove's Cucumber and Green Tea bath products (soap, body wash, hand soap). 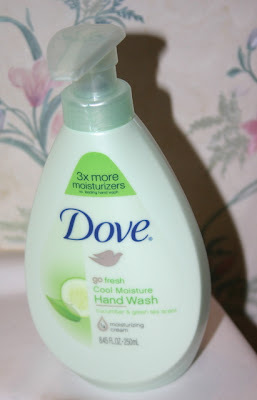 I ADORE the scent of this line, and I got some of the new handsoap for myself. Now, it's time to start thinking about Valentine's treats for next year! How did he know it'd be perfect on my arm? Must be a gift from the Good Lord above! friends will get around noon. tell you more of ... it SOON! Last night I was playing around online and found a museum website in Indiana which offered the L.S. Ayres Tea Room cookbook. I vaguely remember having heard of this cookbook a few years ago, and since I'm interested in studying tearoom cookbooks I ordered a copy. 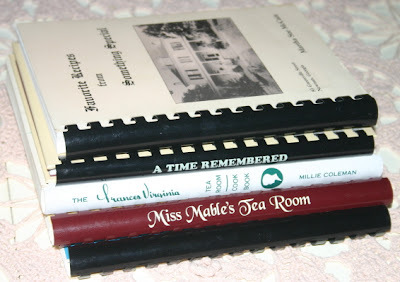 Five of my favorite tearoom cookbooks include The Frances Virginia Tea Room Cookbook (former tearoom in Atlanta), Miss Mable's Tea Room cookbook (still going strong in Tennessee), The Crumpet Tea Room cookbook (still going strong in Arkansas as far as I know), A Time Remembered Tea Room cookbook (in Thomaston, Ga., now closed), and one from right here in Newnan, Ga., Favorite Recipes from Something Special. I first visited Something Special about 15 years ago when it was a quaint ladies-who-lunch tearoom - I dined in the Strawberry Room, as I recall - but those tearoom days are long gone, and it is now a special events center. I love that tearoom owners past and present have compiled some of their favorite recipes to share with friends of the tearoom. Even when a tearoom closes its doors, its spirit of friendship and loveliness lingers, I think, if its memories have been preserved. I can't wait to get the Indiana tea room cookbook. Do any of you have old tearoom cookbooks I should be looking for online or on eBay? 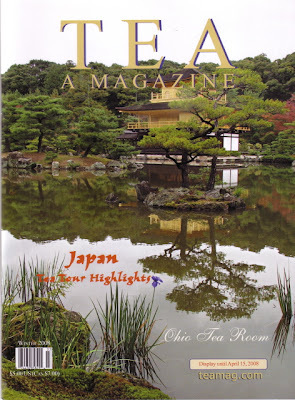 The new issue of Tea A Magazine is here, and as always it's packed full of interesting stories of tea travel, tea recipes, teatime reading and more. One of my favorite stories in the issue is about the Sweet Shalom Tea Room in Ohio, which was opened by three former students of magazine editor Pearl Dexter's TEA School. 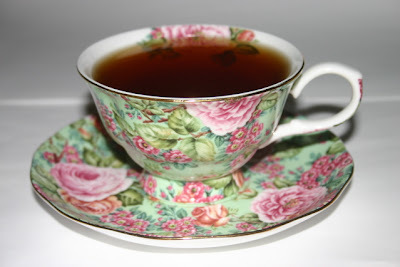 I hope to start a tea room when I turn 50, still a few years away, so I enjoy learning about the various routes to tea room ownership that others have taken. One thing I've observed is that tea room folks always seem to fill several roles, and that one is rarely "just" the owner. Also in this issue is a pictorial feature on a tea strainer collection belonging to one of the magazine's readers, Nancy J. Reppert. One of the strainers, from Turkey, is similar to a piece I bought in a local antique mall not long ago, but for the most part these were strainers I'd never seen before. That's saying something, because I'm always scouting out the eBay offerings and reading book and magazine articles on vintage tea accoutrements. Obviously, I've missed a few varieties, which actually makes the search for them all the more fun. One reason I enjoy this magazine so much, no doubt, is that I simply like the editor. I actually got to (briefly) meet Ms. Dexter at the World Tea Expo last summer, and she was just as friendly and personable as I'd hoped. When she autographed the book I bought, the one on tea and the presidents, she even gave me the "Tea A Magazine" pen she autographed with. In the new issue of her magazine, there are photos of her recent trip to Japan, including one of her actually picking tea there. Now THAT's a tea activity I'd sure like to enjoy one day! PLEASE NOTE: Because of repeated requests, I will soon be making this pattern available for sale as a PDF, so please check back for updates and I'll be glad to let you know when it's available. Thanks! 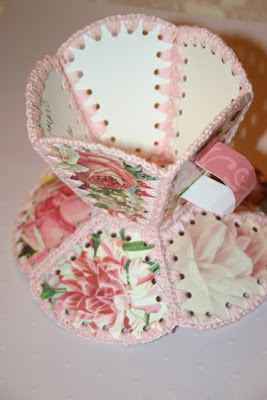 Years ago, I began to see in antique stores some baskets and vases that had been made out of old greeting cards fashioned together with simple crochet stitches. 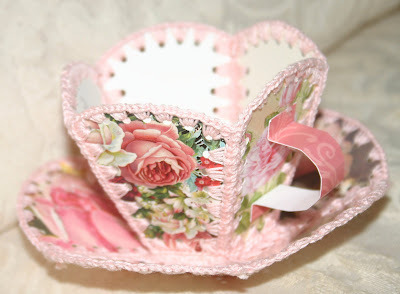 I never bought one, though, because I knew I could make one myself, and I even had the wild idea that I could make one in the shape of a teacup and saucer. So over the weekend, I did. Actually stitching the thing probably took less than two hours. Creating my own patterns probably took about six hours! Still, I'm fairly pleased with my first little effort, and now I have patterns I can adjust for future projects. 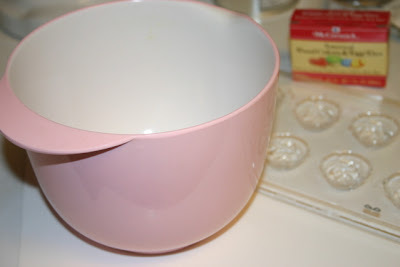 Wouldn't just the cup part be cute with an Easter-basket-style handle, perhaps as a May Day basket for friends? 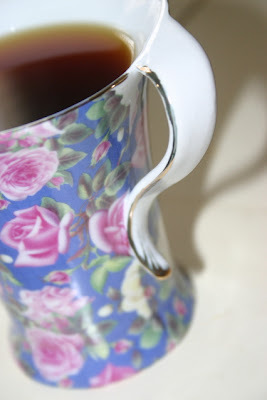 And in case the crocheting tea lovers out there want to make some for yourselves, here are a few photos of what I did. 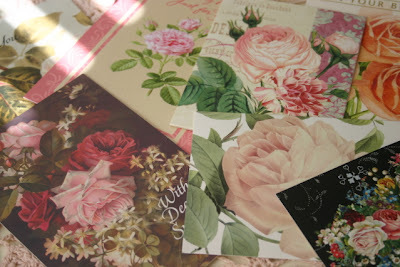 First, I gathered some old greeting cards, which wasn't hard to do because family and friends know how much I love roses and often send cards with this flower on them. Once I got a notebook paper pattern piece to my satisfaction, I traced it four more times, taped the five pieces together 'til I had the size and shape cup I wanted, then traced the pattern piece to thick cardstock. 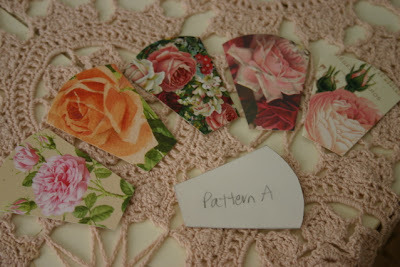 This I cut out and used as the primary pattern for cutting out the greeting card pieces. I punched holes in them using a 1/8 inch holepunch, then single-crocheted around the pieces. Once all the pieces were crocheted up, I joined them with a needle and the same cotton thread I used for the crocheting. 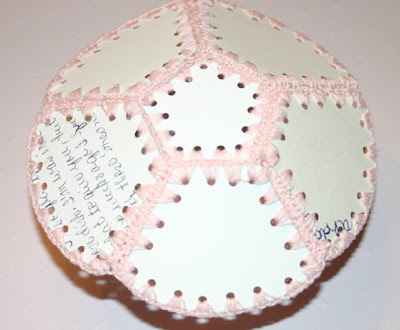 Now I realize none of this makes much sense if you aren't a crocheter, but I would point out that something very similar could probably be accomplished with embroidery, using a simple blanket stitch to join the paper pieces. I did resort to hot glue for attaching a paper handle, but it now occurs to me I might have stitched this on instead. 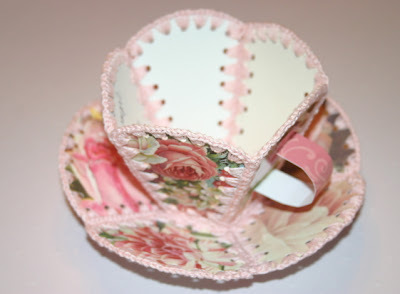 And the saucer (for which patterns were made in the same trial-and-error way) can even be inverted to create a pedestal type teacup if you like. When you turn it over and see handwriting of family and friends, you'll have happy memories to accompany your new papercraft teacup! Here's how I make the sugars: Scoop about a cup or so of granulated sugar into a mixing bowl. 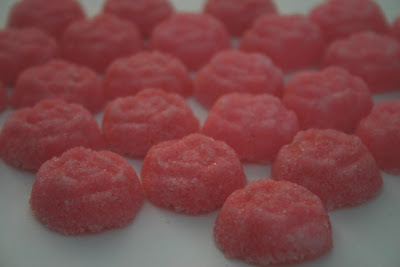 Add just enough water (1-1/2 to 2 tablespoons) to give the sugar the consistency of wet sand when blended with a fork. 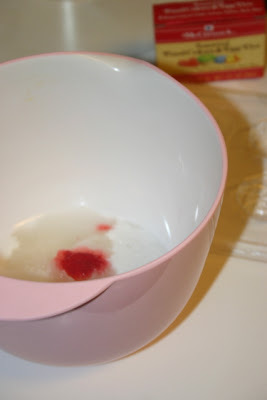 When you add the water, you can also add one drop of food coloring if you like, as I did here, since I wanted pink rose sugar cubes for my Valentine's tea sipping next week. 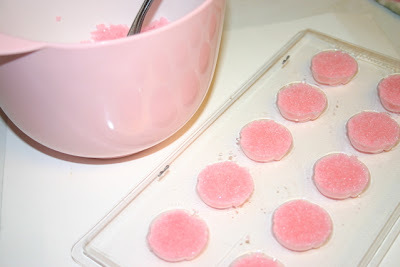 Fill the molds firmly with sugar mixture, let set for about a minute, then turn out onto waxed paper and let harden overnight. Store in airtight container and prepare to impress your friends! Do you have some "Favorite Things" amongst your collection of teawares? I do, and I thought about this after looking at some of those great photos in that "Special Teas" book I got this week. 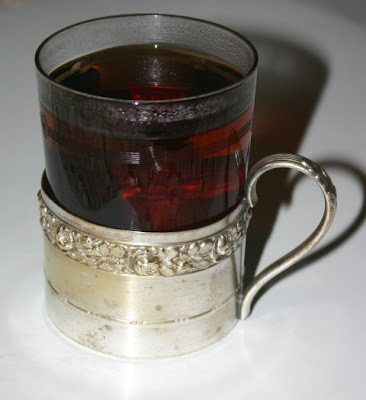 And so when I saw the photos of Russian tea glasses the other night, I was reminded of my one little Russian tea glass that was once a gift from a thoughtful friend. I love the design around the rim of the cup holder, especially the lush roses, and I marvel that someone once took this much care to make a drinking vessel.